And so too is a colonoscopy that delivers a clean bill of health or an early diagnosis. If given the choice, which gift would you prefer? Smart employers know this and prep their managers with bootcamps and tipsheets on how to give good feedback. But no amount of training matters if we’re unwilling or unable to receive the honest truth. Start by recognizing the inherent tension that comes with receiving feedback. We know it’s good for us, exposes our blindspots and reveals how we’re perceived by the people around us. Feedback is how we improve. According to Stone and Heen, feedback comes in three different flavours – appreciation, coaching and evaluation. When we want our boss to recognize a job well done, we’re looking for appreciation. We want our blood, sweat and tears to be recognized. We want to know that we matter and make a difference. When we ask our boss for direction, we want coaching. We want someone to help us learn, grow or change. We want to improve. When we want to know where we stand and how we rank and rate, that’s evaluation. Are we meeting, exceeding or falling short of expectations? Our annual performance review is an evaluation. It also helps to better understand our three emotional triggers that can block and distort feedback. Truth triggers are set off by feedback that we perceive to be unhelpful, unfair or untrue. 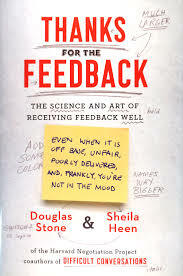 Stone and Heen offer strategies to help us better manage our triggers and get better at receiving feedback. One solid piece of advice is to get specific. Don’t tell your manager that you’d like some feedback. Instead, ask what’s the one thing you see me doing that gets in my own way. Yes, feedback and a colonscopy are gifts. One can save your life. The other can save your career and marriage. As Stone and Heen point out, we swim in a sea of feedback. Some of it is expertly given from people we respect. And some of it sails in unsolicited from left field. We can learn from all of it and use it to become even better version of ourselves.